RESETTLED AND HAPPY COMMUNITY: The Penans of Long Wat are happily resettled at Tagulang. HEART-RENDING SIGHT: A woman carrying her baby in front of a makeshift tent filled with young children at the demonstration area not far from Murum HEP Dam site. BREATHTAKING VIEW: A scenic view of the Penan longhouse at Tegulang Resettlement Scheme. FIGHTING ON: A view of the makeshift tents at the demonstration area not far from the Murum HEP Dam site. CROWDED: Children sheltering from the hot sun in a makeshift tent at the demonstration area not far from Murum HEP Dam site. 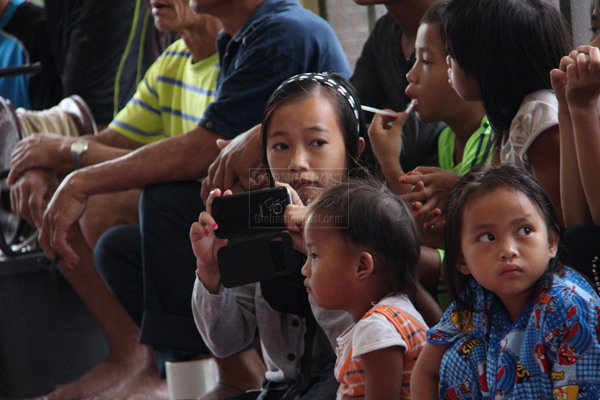 LATEST GADGET: A Penan child taking a video using the latest Samsung handphone model at Tegulang Resettlement Scheme. 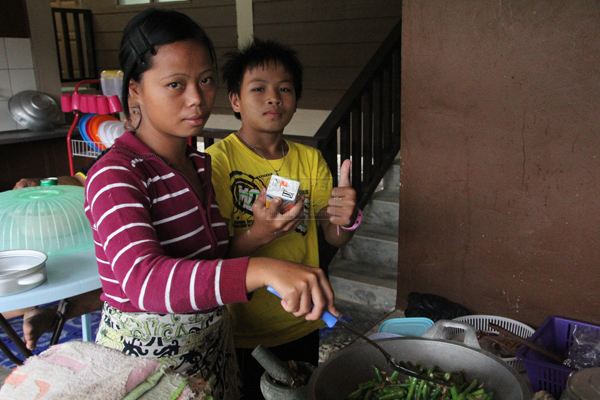 WELL EQUIPPED KITCHEN: A Penan woman frying vegetables at Tegulang Resettlement Scheme as her son looks on. FUN TIME: Two Penan children sharing sweets at Tegulang resettlement Scheme. MURUM, Belaga: The construction of Murum dam has resulted in the 353 affected Penan families taking two different paths – one willing to be resettled and the other staying put until all their demands are met. 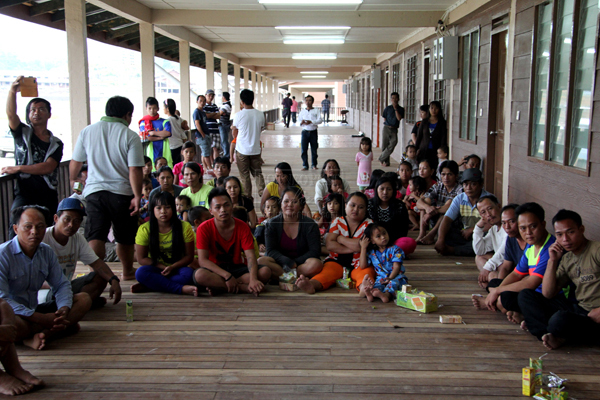 Eighty-nine families comprising about 300 members from Long Wat has settled in Tegulang, adapting to modern living since early last month. 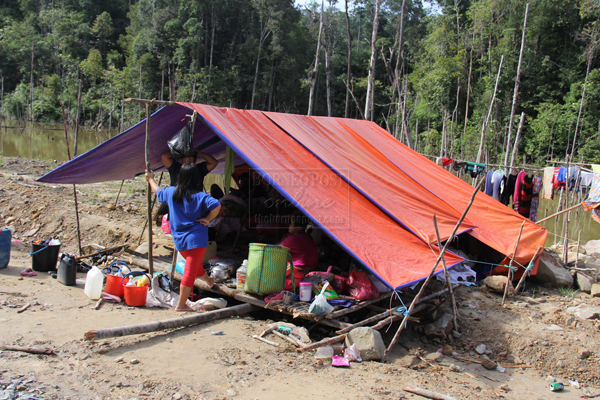 About 100 Penans who refused to be resettled have set up a blockade near the site office of the dam at the junction of the road leading to the dam, about 40 minutes drive from Tegulang, to press their demands. Living in ramshackle camps they put up by the roadside, the protesters, mostly young men, young mothers and children, have been living there without proper sanitation and water supply. 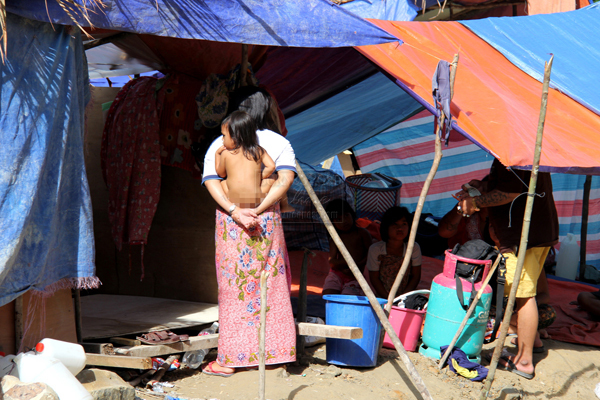 The misery of their living condition is a far cry from the homes at Tegulang which are equipped with piped water, electricity, proper sanitary system, a kitchen furnished with modern cooking utensils, a living room with stereo sound system and television. According to Sarawak Energy Berhad (SEB) Ressettlement Officer Bit Surang, besides land compensation, SEB is now giving each family from Long Wat a subsidy of RM850 per month, comprising RM600 in kinds and RM250 cash. “SEB subsidised the transportation charges, thus the RM600 in kinds are made up of daily necessities and food stuff at Bintulu market prices,” Bit said. Bit also said SEB would request medical personnel to visit the blockade site to screen the young children, who seemed to be unwell. The Borneo Post journalists Phyllis Wong and Peter Sibon, who visited the blockade site last weekend, were first stopped by a group of young protesters from going further towards the dam. The leader of the protest group, Ngang Buling of Long Singu, in allowing them to pass eventually, said they would not be cowed by the presence of the police who were stationed about 100 metres from the blockade. To get a better picture of their demands and situation at the blockade, another The Borneo Post journalist Lian Cheng contacted Raymond Abin the Sarawak Conservation Alliance of Natural Environment coordinator yesterday. Raymond claimed after 15 days of blockading, the Penans only managed to meet Belaga District Officer Abdul Halim Abdullah and Kapit Resident Frederick John forcing them to turn to him yesterday to discuss how best they could convey their requests to the state government. He added that the Penans told him that despite their willingness to negotiate on the terms of their resettlement, they would remain at the blockade indefinitely until both sides agreed to a solution to the impasse. “The length of time for them to be there depends on how SEB or the state government responds to their demands. They will continue to be there until the SEB or the government sent their representatives for negotiation,” said Raymond. When asked if the Penans were willing to compromise on their demands Raymond said the demands of the affected communities had been consistent. He pointed out that the affected villagers had demanded cash compensation of RM500,000 per family but the government had not responded to that demand although it was likely that they would be willing to negotiate on the amount. They also asked for a forest reserve of 30,000 ha for each village as their hunting and foraging ground but the government only promised 20,000 ha for all the affected communities he added. 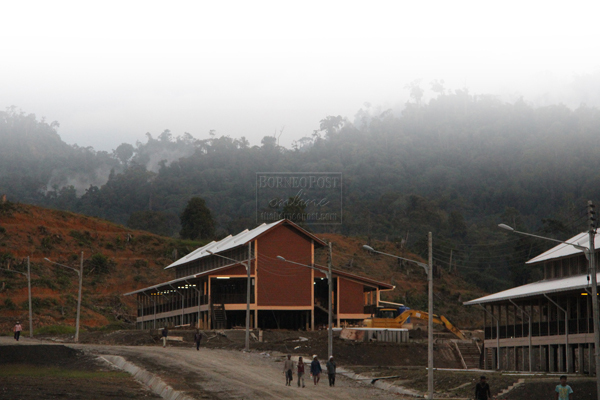 On top of forest reserve, Raymond said the affected Penans also wanted 25 ha of agricultural land for each family. “They are also requesting for free housing, electricity and water. In terms of education, they ask for free education for their children and an education fund to be set up solely for the Penan community affected by the construction of Murum Dam,” said Raymond. Hulu Rajang MP Ugak Wilson Kumbong also visited the dam site last Saturday to meet the protesting Penans that night to help diffuse the situation. However, his meeting with the Penan leaders at the Murum Dam site office did not reach any concrete outcome. Ugak said the State Planning Unit would set up a meeting with them soon although it was not likely to be immediate. “It is not possible because Belaga assemblyman Liwan Lagang is overseas and I am here at the Parliament,” said Ugak.